For the six months ended December 31, 2012, Microsoft received between 6000 and 7000 criminal and national security warrants, subpoenas and orders affecting between 31,000 and 32,000 consumer accounts from U.S. governmental entities, the company said in a blog post. For its part, Facebook said that it had received 9,000 requests of the same nature during the same period. 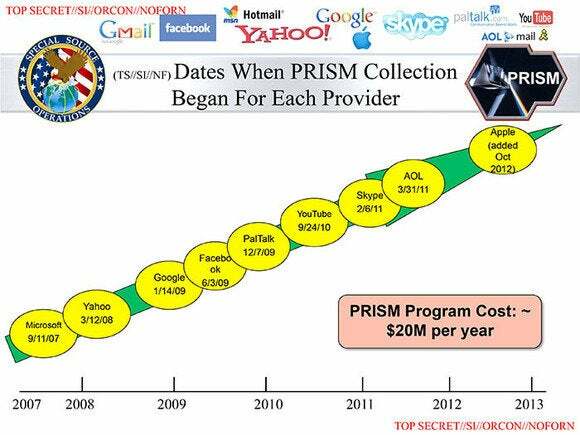 The companies accused of participating in PRISM. Microsoft and Facebook both said that they operated under a number of constraints imposed upon them by the federal government: Both were permitted to report FISA orders, but only if aggregated with law enforcement requests from all other U.S. local, state and federal law enforcement agencies for a six-month period. Both companies were also asked to report their requests as a range of numbers. Microsoft, which has several Web services that could be subject to FISA and other requests, was also required to report all of the requests it received for all of its services, in aggregate. We agree with @Google: It's important to be able to publish numbers of national security requests—including FISA disclosures—separately.